Guidelines have been developed to help event organisers abide by the voluntary Code of Practice. These guidelines are intended to be applicable to a wide range of fishing events whether they are catch and keep or catch and release format and will help to improve fishing event management in NSW. There are many different ways that fishing events can be improved. Please find an example of a catch and release score card here. It is available in two formats to enable changes to the form to suit your individual event. Organisers are requested to submit a fishing event report at the conclusion of their event. These reports gather basic information on participation, rules and captures at each event. The information submitted on this form will enable Recreational Fisheries Managers to maintain a detailed database of fishing events in NSW and assist them in helping to develop this important recreational fishing sector. 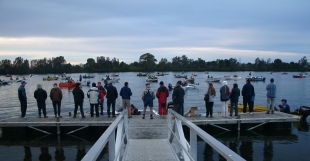 If you require additional detail on how these may be applied to your fishing competition, please contact the NSW DPI Fishing Competition Management Officer on (02) 4916 3827 or fishing.events@dpi.nsw.gov.au. Please note that all information submitted in these reports will only be used by NSW DPI to improve the management of your fisheries resource. All information will be treated as strictly confidential.